The Reds would not have won last night’s game without Jose Iglesias. Caught up briefly with Scooter Gennett. He thinks 7 more weeks at least. Two weeks until the next MRI, even. This is like driving from Cincinnati to Dayton and breaking through the downtown traffic only to join the hideously unscenic I75 traffic. I was very glad for last night’s win, but it also created a creeping sense of unease. It made me That Girl. And I don’t like being That Girl, but… most of the runs this team is generating are from the longball. They’re making absolute WTF errors and decisions on the basepaths, with occasional fielding terribleness that would make my small nephew’s baseball coach drink. 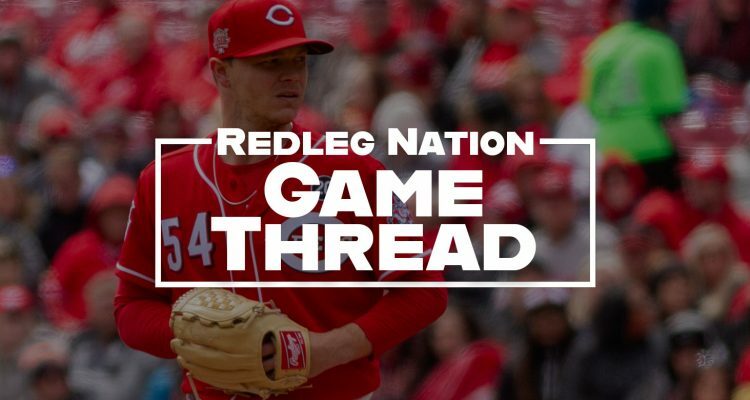 Last night was a win, but would it have been a win if the Reds were playing the Not-Marlins? Today’s game is a Businessman’s Special and I’ll keep calling it a Businessman’s Special because Business Day Special sounds like the most boring sale in the most boring man-clothes store on the planet, and the only kind of store more boring than a man-clothes store is one with nothing but tile samples, whereas a Businessman’s Special sounds like a place where at least some action is about to go down, such as a tense boardroom discussion, or a contract murder. I’ll talk about this at length as I stand here between Not-Cinergy Stadium and Riverfront Coliseum. The Businessman’s Special begins at 12:35. The Marlins have a guy named Pablo, but I don’t know what that means in terms of late twentieth-century crime dramas conducted in pastels. Our Friend Yasiel returns, but pretty much only because he doesn’t want to talk to Joe Torre. 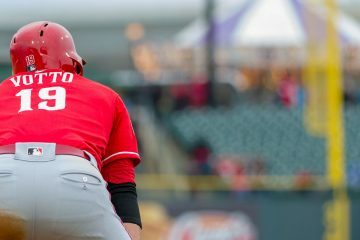 Reds are the first team ever to start a season with 2 or fewer wins in their first 10 games while scoring more runs than they've allowed. -The past two game threads have come to you from the road because I love you and I am a dedicated professional and none of the other writers would switch with me. Yesterday one of the airport restaurants was showing the stupid Yankees, which is why people now hate air travel. Partly. I adored traveling when I was a little girl. Now I’d rather ship myself in a nailed-together, splintery crate because then at least I’m not subjected to a world tour of every upsetting form of leggings Forever XXI has to offer. Free Game of the day on MLB.TV … so far we are 0-2 on free games, so I hope this breaks the streak. Thanks for the tip! Maybe I can get it since I am currently decidedly out of market..
Winker in CF? Really? Probably the slowest non-Catcher on the team. I’m fine with embracing sabermetrics, but this seems a little extreme. Perfect! I’m sure Winker shares Hatteberg’s fear today. Am I gonna have to play the hurting uterus card? Cuz I will. Oh please don’t go there. I beg you. We even got a Miami Vice reference. and Puig’s reply about not wanting an appeal is a great example of not teaching a pig to sing. It wastes your time and and annoys the pig. To ignore the chance for a Miami Vice reference is to deny my birthright as a child of the 80s. Good beginning for our Sonny. 2 inning, two hits but 4K’s to go with that. Wake up Bats! and not the ones in Louisville! But it’d be fine too if they woke up. I hate black out restrictions on free game days! 1.) I can’t believe MBE missed the opportunity for a Romy & Michelle reference by not mentioning the Businesswoman’s Special! 2.) Gotta LOVE the Miami Vice reference, though! Glad the grounder didn’t knock Sonny out of the game. I have seen Romy & Michelle once. 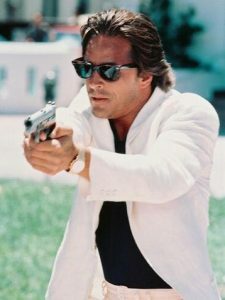 I have seen 26 episodes of Miami Vice. I have been offended by Business Special unto infinity. Winker made a nice catch out there going back to the wall. Much better than Ozuna’s play the other night. Gray is looking good so far. This team been on about a 3 week offensive slump. They have the Cards and Dodgers next and they can’t expect these starters to allow 0 to 2 runs per game. Cards and Dodgers have a good offense and if this team doesn’t start scoring we can go on a 5 or 6 game losing streak pending today. Hard liner off his thigh in the 2nd inning. Prob tightened up? Miami Vice theme here….what happened to Kyle Crockett? 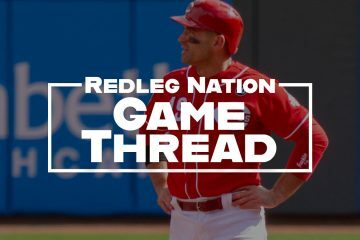 Also whats up with GABP? Walker and Puig’s balls are both easily gone normally? The wind is howling pretty good in Indy….maybe the wind is knocking balls down in Cincy? Puig looked really dejected. Hope he doesn’t start pressing? I’ll admit I was wrong on Stephenson. I would’ve traded him 2-3 years ago for a player never to be named later. He may or may not make it, but his stuff is top shelf! Would have liked to see him stretched out a bit today. Still sorting and Gray could miss a start. going to be a while on wood. plus going to see who starts in a year. think we just had to use a couple of guys a year early before they were ready. Jim Day gave an update on Wood. Out is AZ and hasn’t started to even throw to any batters yet. He’ll have to build up innings so he is at least a month away still. Stephenson looked very good in the 5th. Cowboy was very complimentary. We’re in keep changing pitchers until we find one that isn’t going to work, mode. With a 4 run lead, it give a small amount of flexibility. The rare Friday off tomorrow helps too. Use whoever you need to. Duke and Hernandez got it done today.Good job. Snapped the belt buckle diving for that one … got to love it. No pizza, but we’ll take the SWEEP!!! I credit MBE, reigning Queen of the Game Thread Sweep! !